Watch a Spacecraft Crash Into the Moon, LIVE! The ESA’s SMART-1 spacecraft has run out of fuel after a successful 2 year mission to test new spacecraft technology and study the moon. It is now scheduled to make its own tiny crater on the evening of this coming Saturday September second as it slams into the Lunar surface at a speed of 7,200 kilometers-per-hour. The resultant flash is only likely to last for 20 milliseconds or so, but it may very well be visible, particularly if the dust plume rises high enough to pass outside of the Moon’s shadow into direct sunlight. The nominal impact is predicted to occur at 5:41:44 UT (Universal Time) which is the same as 10:41 pm PDT. There is always the possibility that the space vehicle will auger in on either the prior (during daylight, and so invisible) or successive orbits (visible very early the next morning). The tiny red circle depicts the predicted point of impact. All sorts of interesting science surrounds the mission, but the parts that interest me the most are the technologies used to get the spacecraft to the moon. I am always awed by the incredible precision of our understanding of gravitational trajectories. Check out the planned orbital path that begins with a spiral around Earth with an increasing radius up until it hits a critical stability point and is suddenly transferred to an orbit around the Moon. One other particularly interesting aspect of the mission is that SMART-1’s primary propulsion system hearkens to Star Wars (the movie) technology. Remember the Galactic Empire’s grey and black T.I.E fighters? Well, T.I.E stands for Twin Ion Engine. SMART-1 traveled the full distance and maneuvered for two years on a Xenon Ion Engine rather than a traditional rocket thruster. 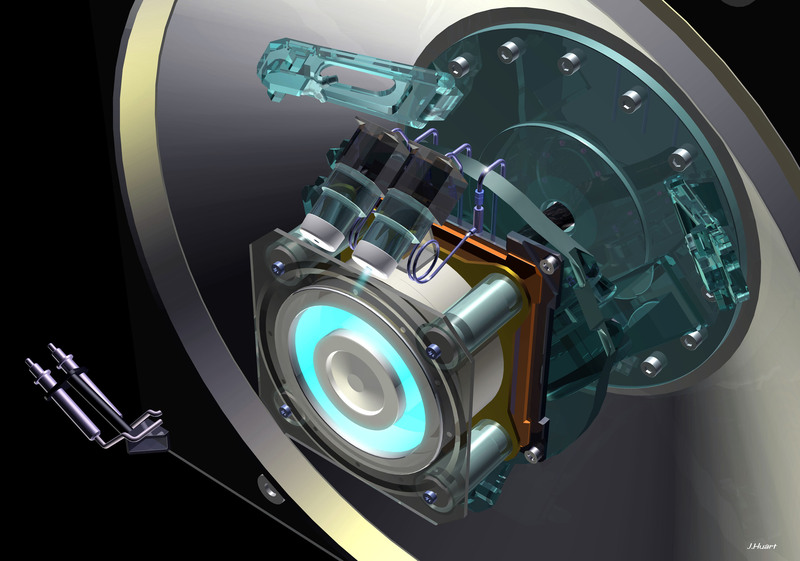 Here is a close-up CAD rendering of the business end of the ion engine. In contrast to a traditional rocket which directs a chemical explosion out of a nozzle to generate thrust, the ion engine strips electrons from Xenon gas, and then uses an electrostatic gun (a high-tech cousin to the one in your tube TV) to accelerate the ions out the back of the craft. While the volume of ionized gas is much smaller than what a chemical rocket would expel, the velocity of the ejected matter is over ten times greater, and there is much less wasted heat and energy. So while the thrust per second is lower, the total thrust can be many times greater for the long-burning ion engine.